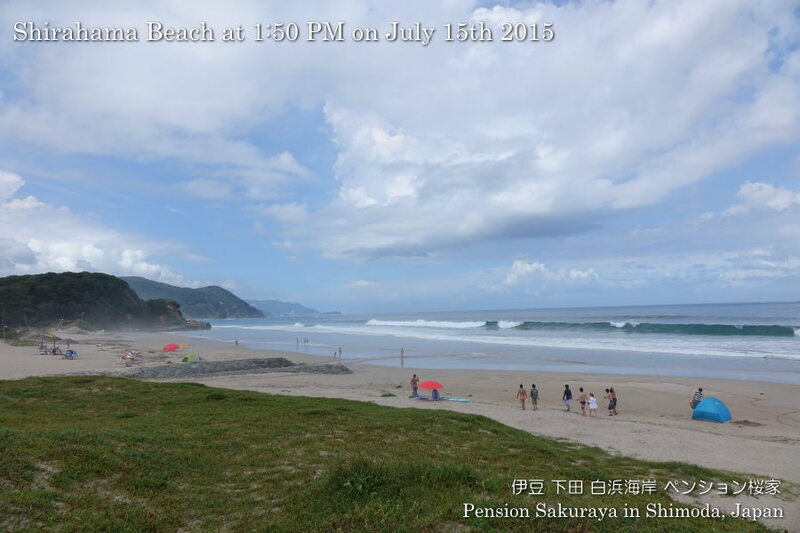 We sometimes had strong west wind, but it was very hot today. 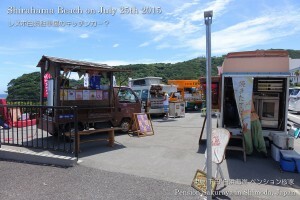 Last summer there were not food cars at the parking behind Seven-Eleven, but they came this summer. This entry was posted in beach, Meal on 2015年7月25日 by izusakuraya. 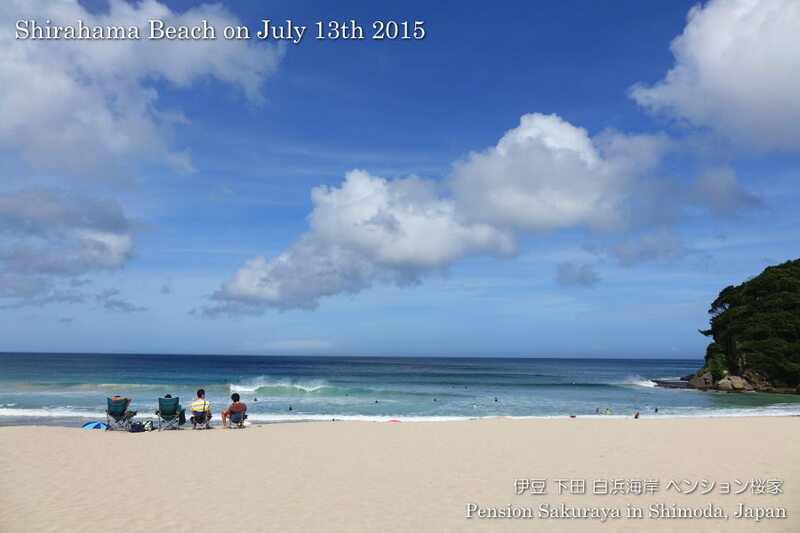 2015/07/20 The Rainy Season was over! 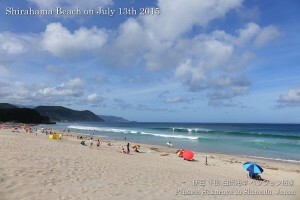 At last the rainy season in Tokai area including Shimoda city has been over today!!! We were excited with the blue sky after a long time. This entry was posted in beach on 2015年7月20日 by izusakuraya. 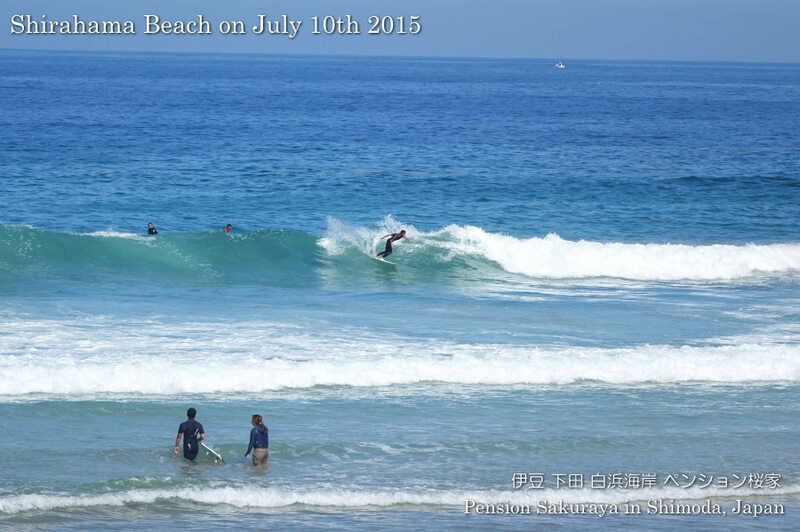 Today swimming was prohibited because of big waves by Typhoon #11 is approaching Japan. Even in such a case surfers can get into the water. 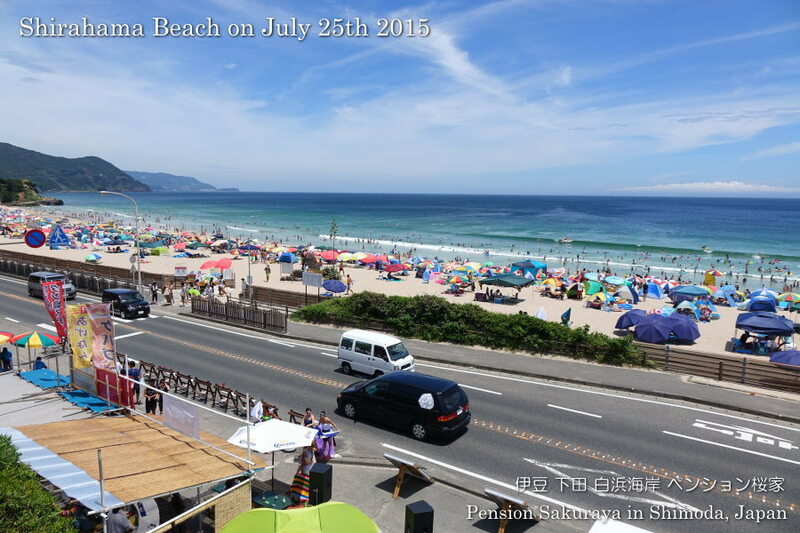 This entry was posted in beach on 2015年7月15日 by izusakuraya. 2015/07/13 Thank you for staying! They are from Canada and have lived in Tokyo since 3 months ago. 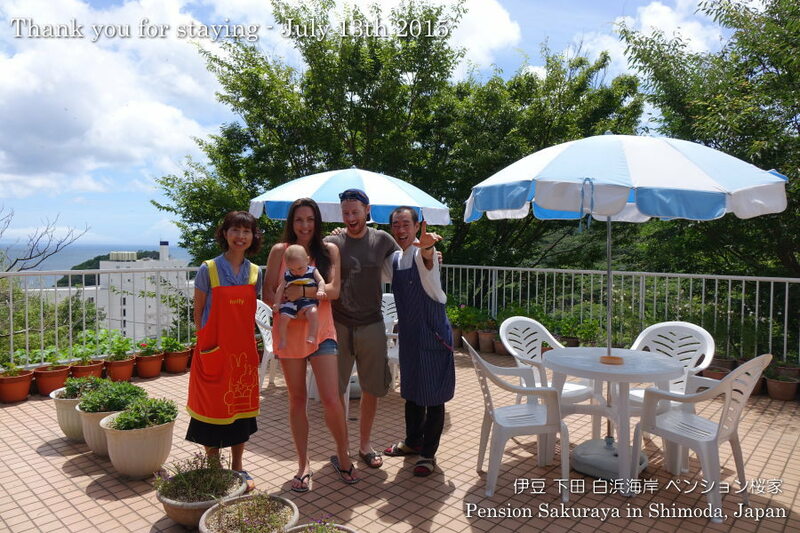 He is a geographer and is interested in the Geo sites, so they went to a lot of places in Izu peninsula by rental car. They are beautiful family and their 7 months baby is really cute! This entry was posted in Customers, Pension Sakuraya, 未分類 on 2015年7月13日 by izusakuraya. 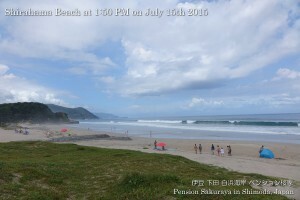 It was beautiful day again, but the waves are getting bigger because of typhoon. The weather forecast said this morning, that it would be almost cloudy, but we had blue sky actually. This entry was posted in beach on 2015年7月13日 by izusakuraya. 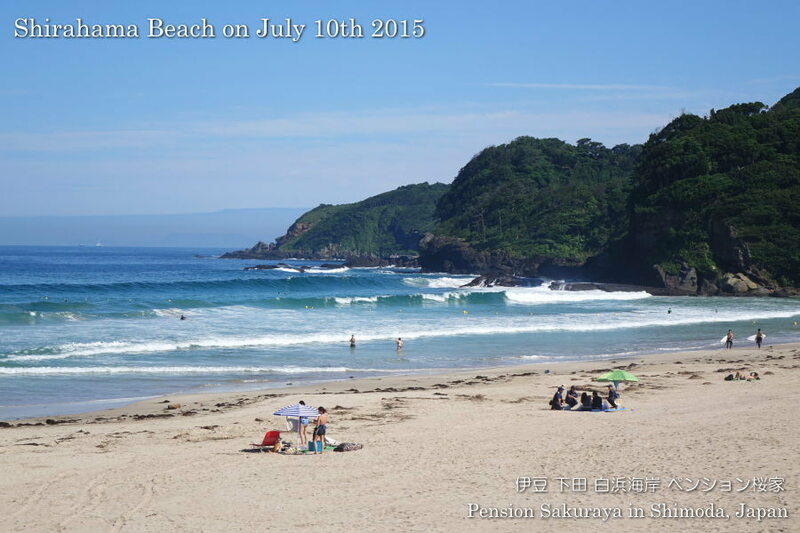 2015/07/11 Perfect Summer Day in Shirahama! Summer season in Shirahama was opened today and the lifesavers also started to patrol on the beach. They will be always with us until the end of August. Thank you for patrolling and saving us. 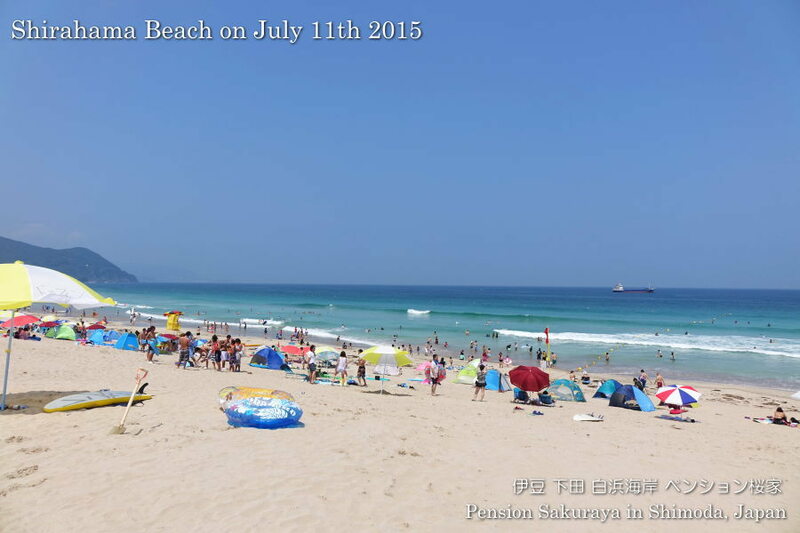 This entry was posted in beach on 2015年7月11日 by izusakuraya. 2015/07/10 Blue Sea came back to Shirahama! The sun and the blue sky came back to Shimoda after a long time today!! 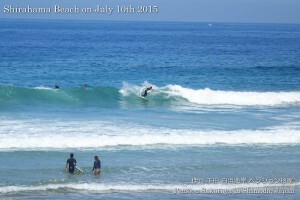 There were some people swimming on the beach and the surfers had good waves! 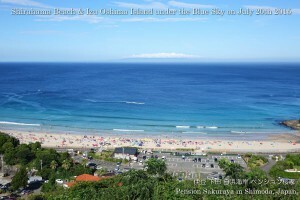 The summer season in Shirahama will be start tomorrow. 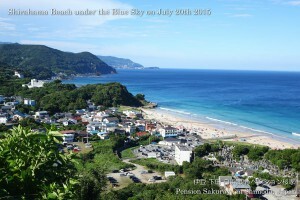 The blue sea is ready to welcome a lot of people. Let’s go to the beach!! 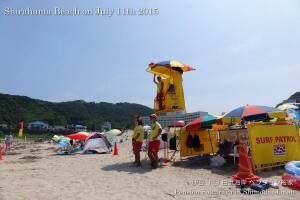 You can see the other pictures which I took on the beach today on our Facebook. This entry was posted in beach on 2015年7月10日 by izusakuraya. 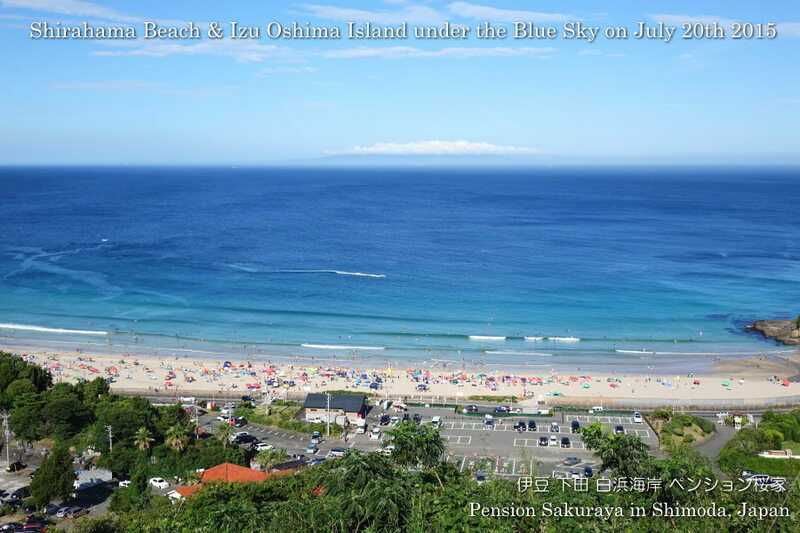 I don’t remember when we had a blue sky… but the blue sky came back to Shirahama after a long time. But it became rainy about 3 hours later and we sometimes had heavy rain again. The weather forecast says it will be rainy tomorrow and the day after tomorrow, but it will be sunny this weekend. 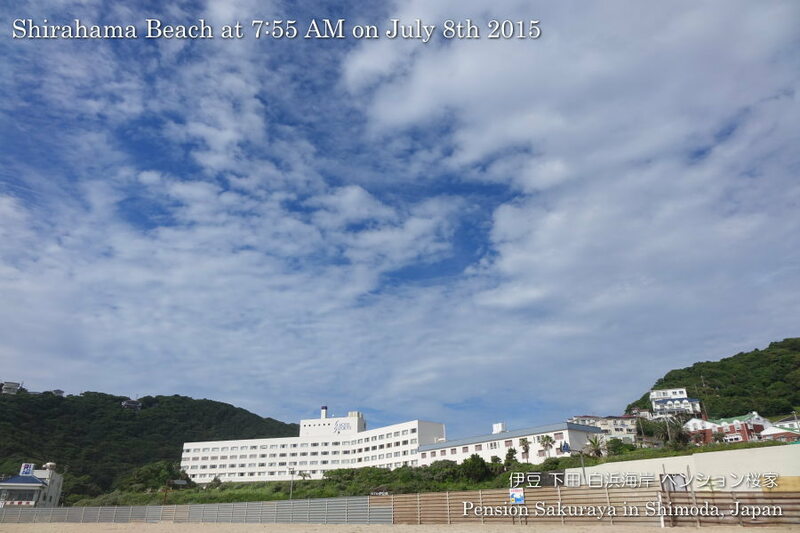 This entry was posted in beach, nature on 2015年7月8日 by izusakuraya. 2015/07/07 Thank you for staying. 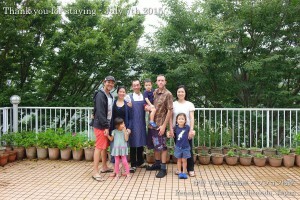 They are two families from Tokyo and Australia, and came to Shimoda for the 1st time. 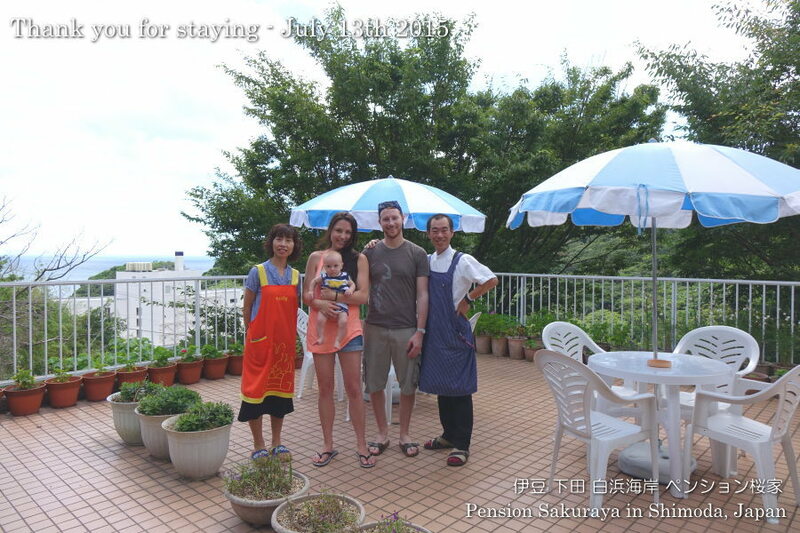 During their stay they went to Kawazu Seven Waterfalls by bus and they took Onsen at Amagi-sou hotel. They were very excited with the outdoor hot spring on the riverside looking over the waterfall from a swollen river by the heavy rain. 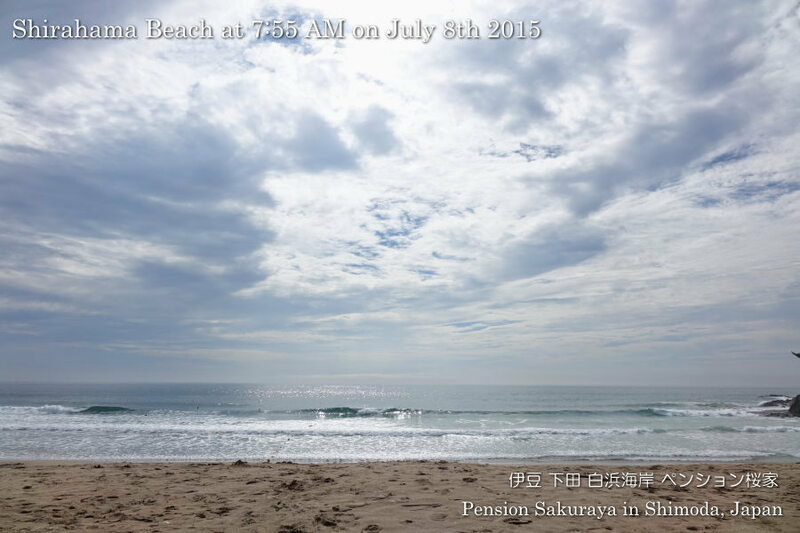 This entry was posted in Customers, Pension Sakuraya on 2015年7月7日 by izusakuraya. 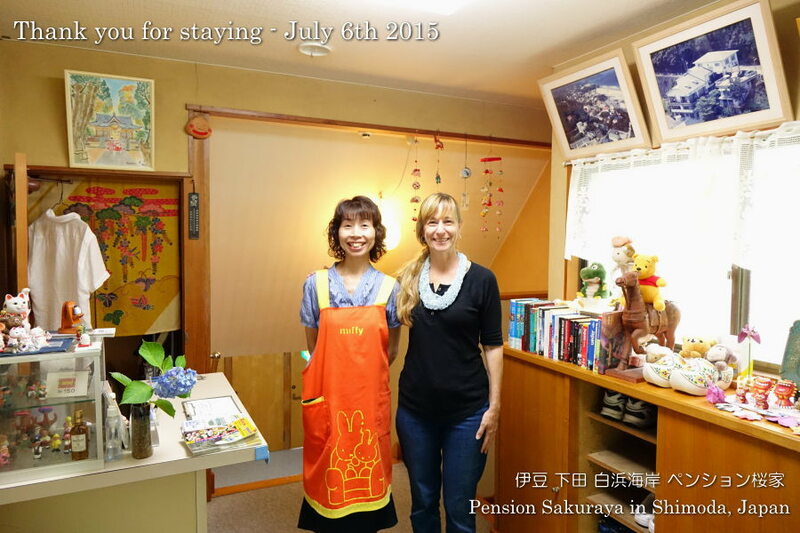 2015/07/06 Thank you for staying! She came from the United States and stayed for 5 nights. 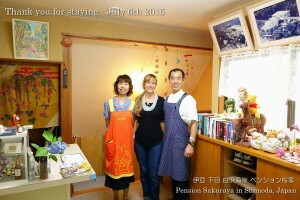 She has stayed at Pension Sakuraya 2 years ago, so it was 2nd time to stay with us. It had been almost cloudy and rainy during her stay, but she said that she was able to be relaxed. We were very glad to hear that she said when she checked out. 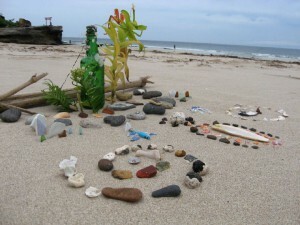 She sent us an e-mail with the picture which she took on the beach. 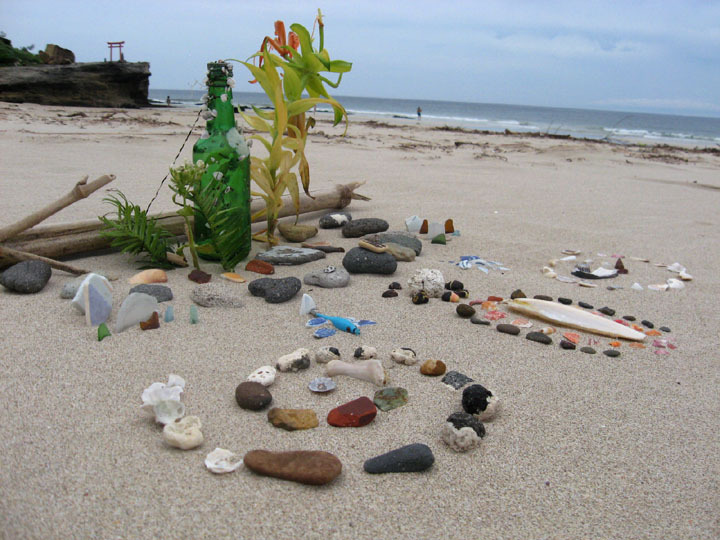 This is a work that she made on Shirahama beach. 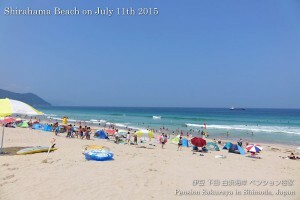 This entry was posted in 未分類 on 2015年7月6日 by izusakuraya.